I would like to present on iModeler a next model from my output. 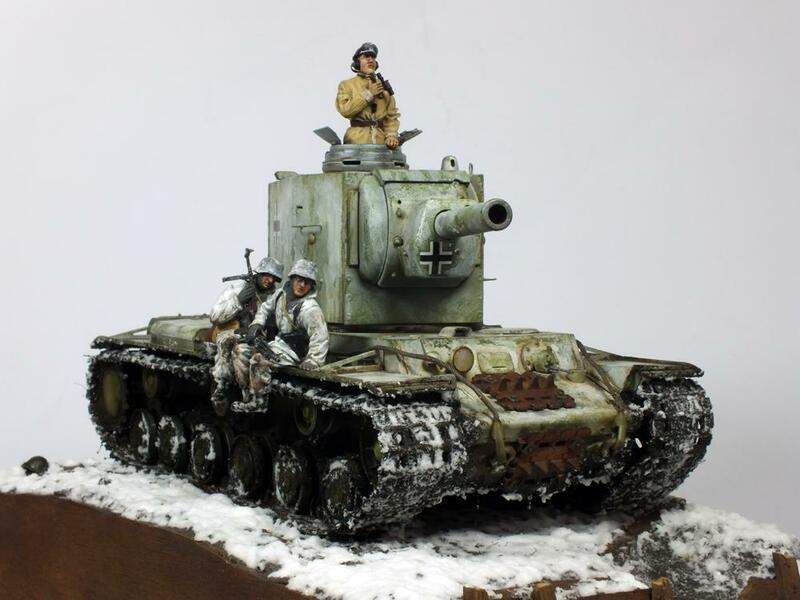 It’s a built few years ago soviet heavy tank KW-2 from WWII times in scale 1:35. 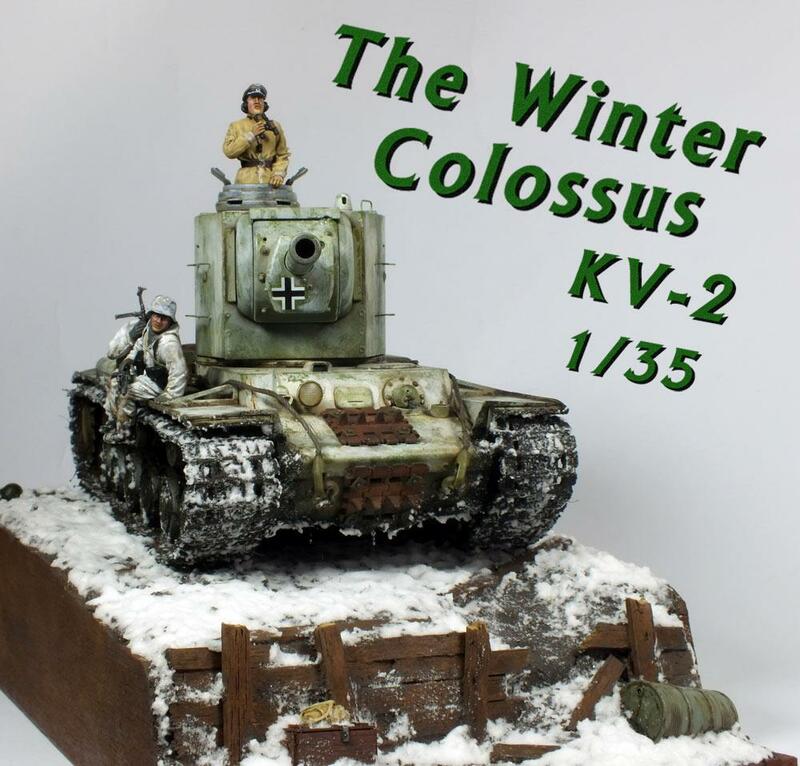 KW-2 was a quite unwieldy colossus, despite this, some of captured KW-2s were introducet into german army for reinforcement or replenishment. I built my model as one of the captured KW-2s. I used Trumpeter’s set with some addons like metal barrel, shackles, towing ropes, wire made ladder on the turret and lamp cabel. 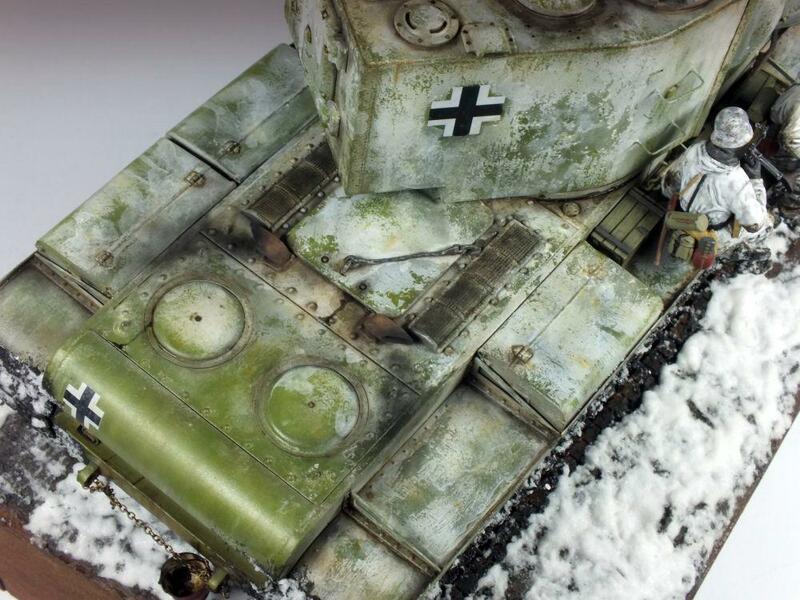 I also added a commander’s copula taken from Pz.Kpfw IV model. 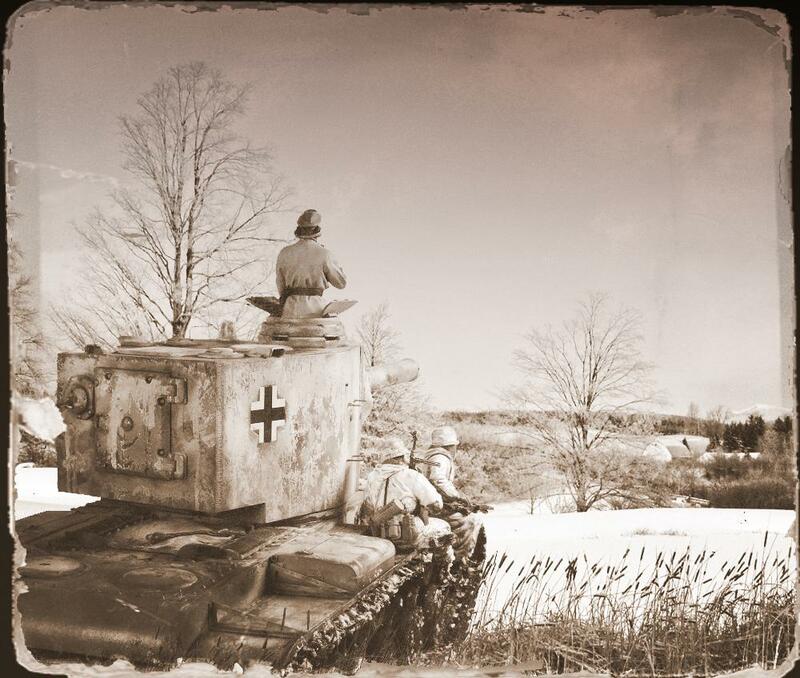 You can often see in the pictures, that germans were adding own copulas to captured soviet tanks. 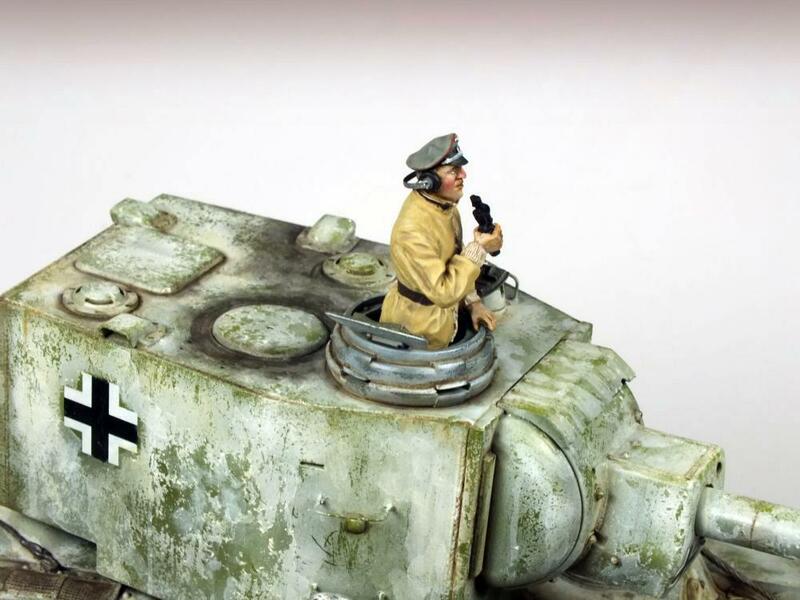 That’s becouse originaly soviet tanks had very few periscopes. 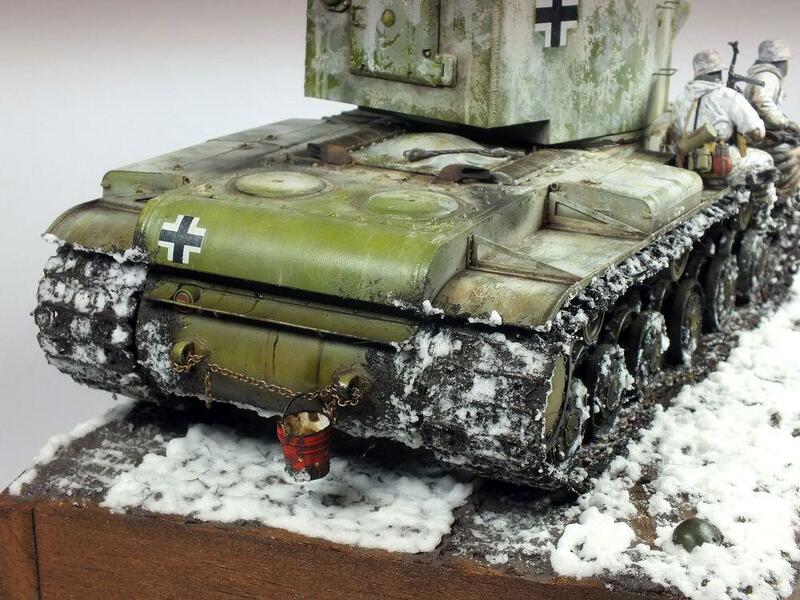 Over all green paint scheme looks little boring to me, so I decided to put my model in a winter uniform. For that I used popular hairspray technique. 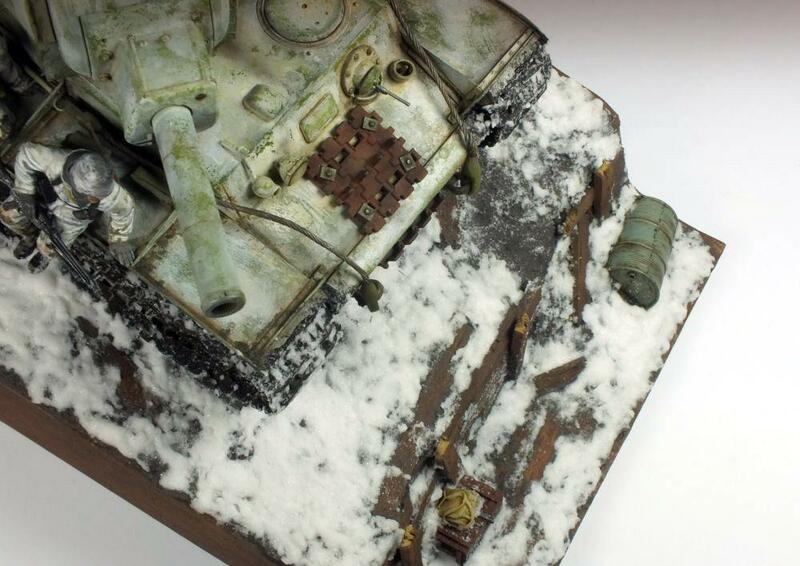 Tank model with mud on tracks, other dirt and snow needs a base or little diorama to get appropriate context. Just like my published earlier MiG-15 🙂 If building bases like that is interesting, I will post someting more about that in future articles. 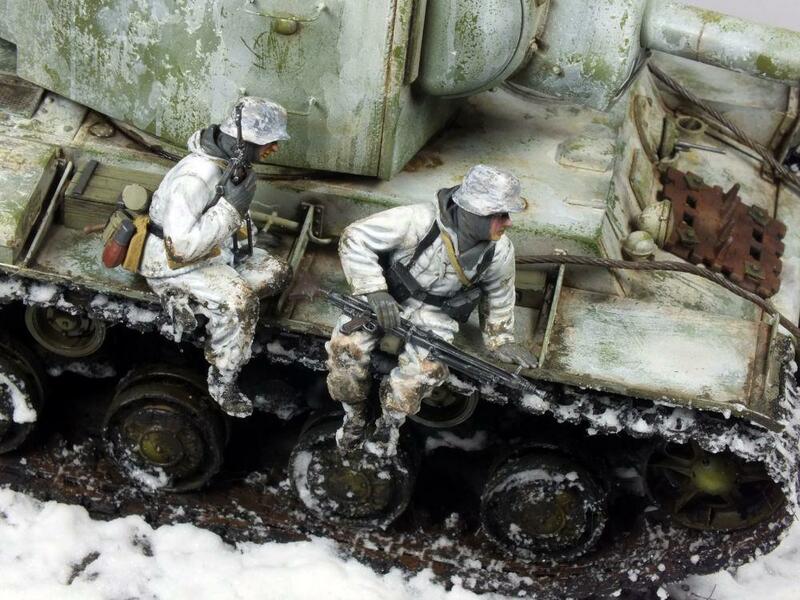 For now I have to mention that snow was easily made from baking soda mixed with acrilic floor lacquer. KW-2 is shown as arrived to some enemy trenches. Commander is scanning area, guys riding at fender are preparing to descent. 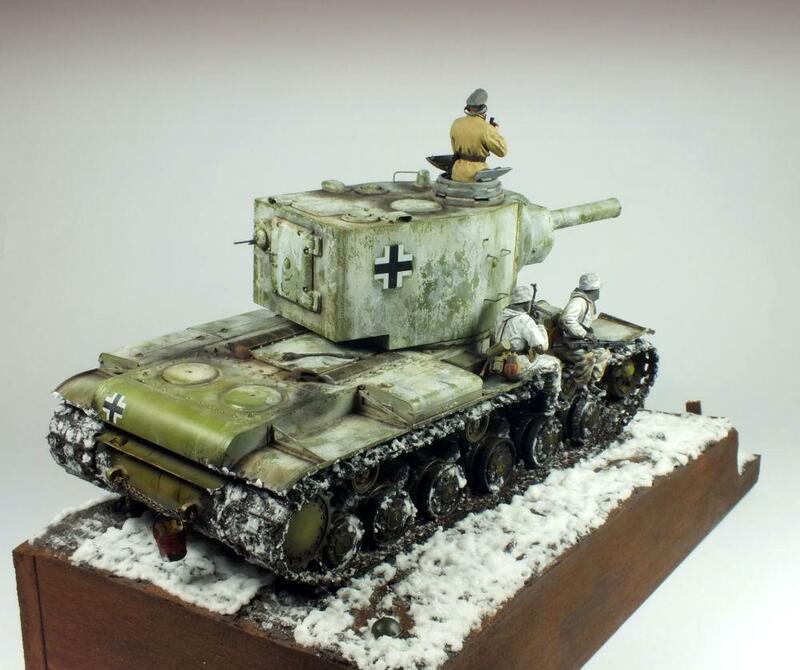 Very realistic looking little diorama….nice work, sir. 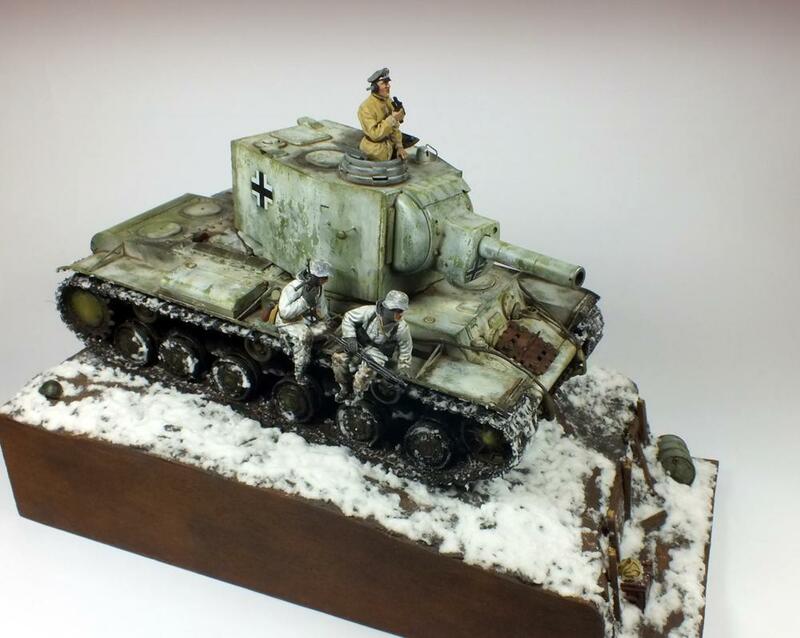 Bartek, very well done, the model itself looks great and the diorama really frames it well, (although it makes me feel cold and miserable). I like it a lot. I’m going to go and sit by the fireplace for awhile now ! Very nicely done, Bartok! You mentioned the snow is baking soda and acrylic floor lacquer – is that something like Future Floor Polish? The lacquer I used is popular in Poland Sidolux. And yes, it’s an equivalent of Future. That looks cold and miserable. Well done! Holy Smokes! That is amazing work Bartek!! I’m looking forward to future postings. 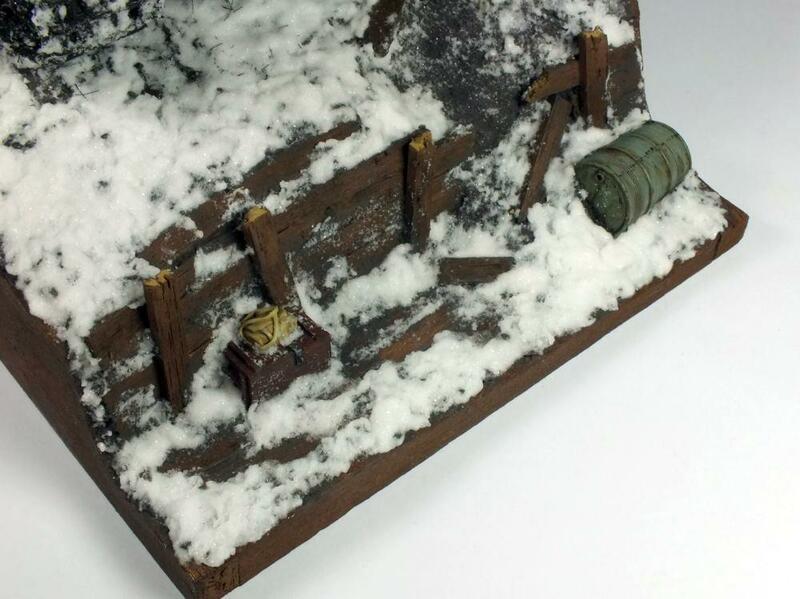 I think a lesson on how you built the base, or bases in general would be a fantastic idea for an article. Excellent posting!!! Fantastic – all the way down to the staining inside the red bucket! Looks perfect! Bartek, beautifully done! The “black and white” photo is as real as it gets! 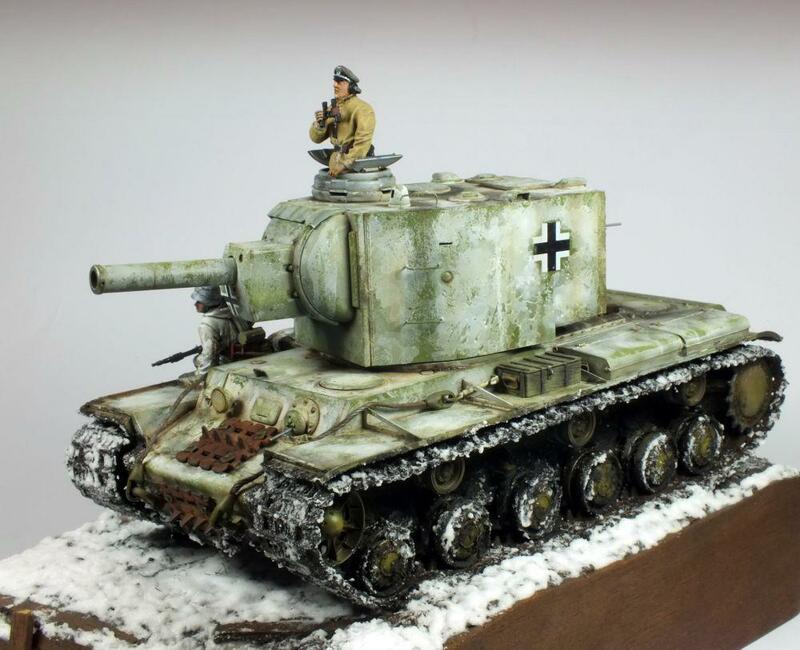 I hate the winter, Bartek, but I like your model, you’ve captured the atmosphere very well, and the extra detailing on the tank makes all the difference. How to pack a model.